Guest blog post by Timothy E. Guertin, President and CEO of Varian Medical Systems of Palo Alto, CA. Editor’s Note: Varian Medical Systems focuses energy on saving lives. By partnering with customers and others, the people of Varian develop leading solutions for improving cancer treatment, X-ray imaging, and security. 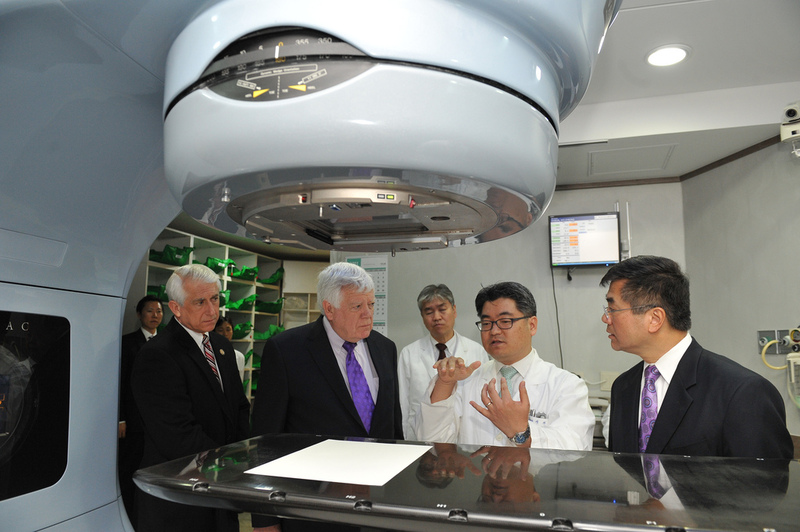 Varian Medical Systems is honored that Secretary Locke and an esteemed Congressional delegation devoted time to seeing our systems treating cancer patients at Seoul National University Hospital (SNUH), while on a trade mission to the Republic of Korea. SNUH, a longtime partner of Varian, provides some of the most leading edge cancer treatments available to those stricken with this terrible disease. The Varian linear accelerators that perform radiotherapy treatments at SNUH were manufactured in California and then installed and serviced by a team of technicians in Seoul, providing jobs on both sides of the Pacific. While visiting the radiation oncology department at SNUH, Secretary Locke was able to see firsthand the easy and painless process a cancer patient goes through when being treated with radiotherapy. Radiotherapy is a non-invasive technique that targets tumors with high-energy photon beams that stop cancer cells from reproducing. Treatments on Varian linear accelerators are tailored for each patient, focusing on breast, prostate, brain, lung and other types of cancers. In the next several months, SNUH will be acquiring the new Varian TrueBeam system that will enable clinicians in Seoul to treat more complex cases, while at the same time reducing treatment times for patients. We are able to place Varian technology in the hands of oncologists in Seoul thanks to the existing beneficial trade relationship between the U.S. and Korea. However, this relationship would be further strengthened if the pending US-Korea Trade Agreement was ratified, thereby eliminating the existing tariff barriers that are currently in place for technology like ours. Should the trade agreement be finalized, it would eliminate an 8 percent tariff for Varian and potentially lead to business growth in both the U.S. and Korea. In addition, it would help to make the most advanced cancer treatment in the world available to more patients in Korea. It is my hope that patients in Korea and all over the world will continue to benefit from the collaborative innovation that occurs due to mutually beneficial trade relationships. In order to continue to innovate new ways to treat cancer and other diseases, we need to ensure that we can keep working together around a common goal. Submitted on May 20, 2011 - 8:55pm. Funding for Varian Medical Systems can be easily obtained through Medical Receivables Factoring which will provide the financing these Medical professionals need to ensure their success. Submitted on July 17, 2011 - 3:46pm. I think the advances in radiation oncology are a boon to patients and healthcare providers alike. As a physical therapy business owner, I treat many cancer survivors, and it is good to see proactive efforts from different governments to ensure we keep working together, as providers between countries work to help cancer patients. Submitted on July 28, 2011 - 11:55am. As a medical professional and physical therapy marketing practitioner, I am very glad that our country is improving our ability to treat cancer. As a physical therapist, I hope that a new technology will also be brought in for injury rehabilitation.